Photo: The real Bethany Hamilton is overcoming her fear and surfing Jaws with one arm. 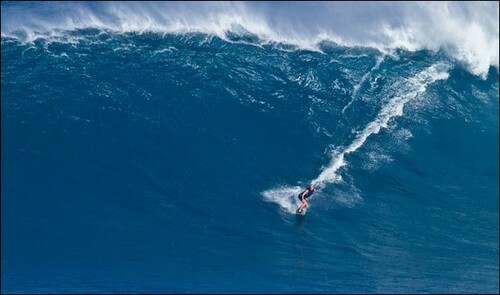 I remember when this happend, when then 13 year old Bethany Hamilton lost her arm in a Tiger shark attack. How she struggled her way back to surfing to paddle with only one arm and to be one of the best surfer girls. She wrote her authobiografie Soul Surfer: A True Story of Faith, Family, and Fighting to Get Back on the Board in 2004. The Hollywood drama Soul surfer based on the book was released in 2011 it contains all cheesy Hollywood ingredients but it is true and inspiring and absolute fantastic story and is an absolute must see for me its true amazing and really inspiring. It is out on Blue Ray and DVD. Jag kom ihåg när detta hände när då 13 åriga Bethany Hamilton förlorade sin ena arm i en Tigerhajattack. Hur hon kämpade sig tillbaka att surfa att paddla med bara en arm och bli en av de bästa surfarna i världen. Hon skrev sin självbiografi Soul Surfer: A True Story of Faith, Family, and Fighting to Get Back on the Board 2004. Hollywooddramat Soul Surfer baserat på boken gick upp på biograferna 2011. Filmen innehåller alla detaljer som ett riktigt Hollywoodrama kan tänka sig ha, jag måste se den, historien är sann, helt fantastisk och väldigt inspirerande.